NTR, mark he created in the film industry is just unsurpassed. Nandamuri Taraka Rama Rao also proved himself as one of the most dynamic leaders of those times. Hailed for his effective administration, he is remembered as a great politician too. Today marks the birth anniversary of the legendary actor Nandamuri Taraka Rama Rao. Many celebrities, actors, and family members were present at the memorial of NTR to give him tributes. NTR Ghat were the mortal remains of Taraka Rama Rao is kept was crowded with fans and followers. 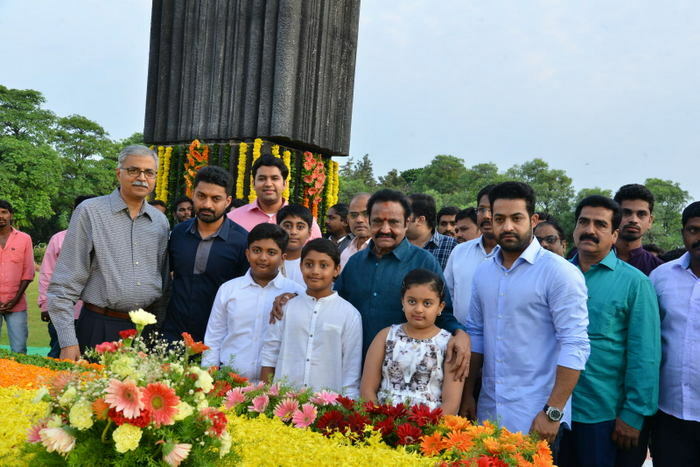 Harikrishna, NTR, Kalyan Ram etc were present at the memorial. They offered tributes and prayers to NTR. Talking about the same, Harikrishna told that NTR- his father has given them the legacy which not only makes them proud but also teaches a lifestyle. He also mentioned that every family needs a person like NTR. Many other celebrities, actors, politicians visited the memorial of NTR today. Also, some of them took their social media sites to remember the legendary hero Nandamuri Taraka Rama Rao.